Proprietary Name: Janumet What is the Proprietary Name? Non-Proprietary Name: Sitagliptin And Metformin Hydrochloride What is the Non-Proprietary Name? Janumet with NDC 0006-0575 is a a human prescription drug product labeled by Merck Sharp & Dohme Corp.. The generic name of Janumet is sitagliptin and metformin hydrochloride. The product's dosage form is tablet, film coated and is administered via oral form. FDA Application Number: NDA022044 What is the FDA Application Number? Start Marketing Date: 03-30-2007 What is the Start Marketing Date? Why is metformin medication prescribed? Why is sitagliptin medication prescribed? Postmarketing cases of metformin-associated lactic acidosis have resulted in death, hypothermia, hypotension, and resistant bradyarrhythmias. The onset of metformin-associated lactic acidosis is often subtle, accompanied only by nonspecific symptoms such as malaise, myalgias, respiratory distress, somnolence, and abdominal pain. Metformin-associated lactic acidosis was characterized by elevated blood lactate levels (>5 mmol/Liter), anion gap acidosis (without evidence of ketonuria or ketonemia), an increased lactate/pyruvate ratio, and metformin plasma levels generally >5 mcg/mL [see Warnings and Precautions (5.1)].Risk factors for metformin-associated lactic acidosis include renal impairment, concomitant use of certain drugs (e.g., carbonic anhydrase inhibitors such as topiramate), age 65 years old or greater, having a radiological study with contrast, surgery and other procedures, hypoxic states (e.g., acute congestive heart failure), excessive alcohol intake, and hepatic impairment.Steps to reduce the risk of and manage metformin-associated lactic acidosis in these high risk groups are provided in the full prescribing information [see Dosage and Administration (2.2), Contraindications (4), Warnings and Precautions (5.1), Drug Interactions (7), and Use in Specific Populations (8.6, 8.7)]. If metformin-associated lactic acidosis is suspected, immediately discontinue JANUMET and institute general supportive measures in a hospital setting. Prompt hemodialysis is recommended [see Warnings and Precautions (5.1)]. The dosage of JANUMET should be individualized on the basis of the patient's current regimen, effectiveness, and tolerability while not exceeding the maximum recommended daily dose of 100 mg sitagliptin and 2000 mg metformin. Initial combination therapy or maintenance of combination therapy should be individualized and left to the discretion of the health care provider. JANUMET should generally be given twice daily with meals, with gradual dose escalation, to reduce the gastrointestinal (GI) side effects due to metformin. JANUMET must not be split or divided before swallowing.The starting dose of JANUMET should be based on the patient's current regimen. JANUMET should be given twice daily with meals. The following doses are available: 50 mg sitagliptin/500 mg metformin hydrochloride50 mg sitagliptin/1000 mg metformin hydrochloride.The recommended starting dose in patients not currently treated with metformin is 50 mg sitagliptin/500 mg metformin hydrochloride twice daily, with gradual dose escalation recommended to reduce gastrointestinal side effects associated with metformin. The starting dose in patients already treated with metformin should provide sitagliptin dosed as 50 mg twice daily (100 mg total daily dose) and the dose of metformin already being taken. For patients taking metformin 850 mg twice daily, the recommended starting dose of JANUMET is 50 mg sitagliptin/1000 mg metformin hydrochloride twice daily. No studies have been performed specifically examining the safety and efficacy of JANUMET in patients previously treated with other oral antihyperglycemic agents and switched to JANUMET. Any change in therapy of type 2 diabetes should be undertaken with care and appropriate monitoring as changes in glycemic control can occur. Assess renal function prior to initiation of JANUMET and periodically thereafter. JANUMET is contraindicated in patients with an estimated glomerular filtration rate (eGFR) below 30 mL/min/1.73 m2 [see Contraindications (4) and Warnings and Precautions (5.1)]. JANUMET is not recommended in patients with an eGFR between 30 and less than 45 mL/min/1.73 m2 because these patients require a lower dosage of sitagliptin than what is available in the fixed combination JANUMET product. Discontinue JANUMET at the time of, or prior to, an iodinated contrast imaging procedure in patients with an eGFR between 30 and 60 mL/min/1.73 m2; in patients with a history of liver disease, alcoholism, or heart failure; or in patients who will be administered intra-arterial iodinated contrast. Re-evaluate eGFR 48 hours after the imaging procedure; restart JANUMET if renal function is stable [see Warnings and Precautions (5.1)]. 50 mg/500 mg tablets are light pink, capsule-shaped, film-coated tablets with "575" debossed on one side.50 mg/1000 mg tablets are red, capsule-shaped, film-coated tablets with "577" debossed on one side. Renal ImpairmentThe postmarketing metformin-associated lactic acidosis cases primarily occurred in patients with significant renal impairment. The risk of metformin accumulation and metformin-associated lactic acidosis increases with the severity of renal impairment because metformin is substantially excreted by the kidney. Clinical recommendations based upon the patient's renal function include [see Dosage and Administration (2.2), Clinical Pharmacology (12.3)]: Before initiating JANUMET, obtain an estimated glomerular filtration rate (eGFR). JANUMET is contraindicated in patients with an eGFR below 30 mL/min/1.73 m2 [see Contraindications (4)]. JANUMET is not recommended in patients with an eGFR between 30 and less than 45 mL/min/1.73 m2 because these patients require a lower dosage of sitagliptin than what is available in the fixed combination JANUMET product. Obtain an eGFR at least annually in all patients taking JANUMET. In patients at increased risk for the development of renal impairment (e.g., the elderly), renal function should be assessed more frequently. Drug Interactions	The concomitant use of JANUMET with specific drugs may increase the risk of metformin-associated lactic acidosis: those that impair renal function, result in significant hemodynamic change, interfere with acid-base balance or increase metformin accumulation [see Drug Interactions (7)]. Therefore, consider more frequent monitoring of patients. Age 65 or Greater	The risk of metformin-associated lactic acidosis increases with the patient's age because elderly patients have a greater likelihood of having hepatic, renal, or cardiac impairment than younger patients. Assess renal function more frequently in elderly patients [see Use in Specific Populations (8.5)]. Radiological Studies with Contrast	Administration of intravascular iodinated contrast agents in metformin-treated patients has led to an acute decrease in renal function and the occurrence of lactic acidosis. Stop JANUMET at the time of, or prior to, an iodinated contrast imaging procedure in patients with an eGFR between 30 and 60 mL/min/1.73 m2; in patients with a history of hepatic impairment, alcoholism, or heart failure; or in patients who will be administered intra-arterial iodinated contrast. Re-evaluate eGFR 48 hours after the imaging procedure, and restart JANUMET if renal function is stable. Surgery and Other Procedures	Withholding of food and fluids during surgical or other procedures may increase the risk for volume depletion, hypotension and renal impairment. JANUMET should be temporarily discontinued while patients have restricted food and fluid intake. Hypoxic States	Several of the postmarketing cases of metformin-associated lactic acidosis occurred in the setting of acute congestive heart failure (particularly when accompanied by hypoperfusion and hypoxemia). Cardiovascular collapse (shock), acute myocardial infarction, sepsis, and other conditions associated with hypoxemia have been associated with lactic acidosis and may also cause prerenal azotemia. When such events occur, discontinue JANUMET. Excessive Alcohol Intake	Alcohol potentiates the effect of metformin on lactate metabolism and this may increase the risk of metformin-associated lactic acidosis. Warn patients against excessive alcohol intake while receiving JANUMET. Hepatic Impairment	Patients with hepatic impairment have developed with cases of metformin-associated lactic acidosis. This may be due to impaired lactate clearance resulting in higher lactate blood levels. Therefore, avoid use of JANUMET in patients with clinical or laboratory evidence of hepatic disease. Metformin hydrochloride	JANUMET is contraindicated in patients with severe renal impairment [see Contraindications (4) and Warnings and Precautions (5.1)]. There have been postmarketing reports of worsening renal function, including acute renal failure, sometimes requiring dialysis. Before initiation of therapy with JANUMET and at least annually thereafter, renal function should be assessed. In patients in whom development of renal dysfunction is anticipated, particularly in elderly patients, renal function should be assessed more frequently and JANUMET discontinued if evidence of renal impairment is present. SitagliptinWhen sitagliptin was used in combination with a sulfonylurea or with insulin, medications known to cause hypoglycemia, the incidence of hypoglycemia was increased over that of placebo used in combination with a sulfonylurea or with insulin [see Adverse Reactions (6)]. Therefore, patients also receiving an insulin secretagogue (e.g., sulfonylurea) or insulin may require a lower dose of the insulin secretagogue or insulin to reduce the risk of hypoglycemia [see Drug Interactions (7.4)]. Metformin hydrochlorideHypoglycemia does not occur in patients receiving metformin alone under usual circumstances of use, but could occur when caloric intake is deficient, when strenuous exercise is not compensated by caloric supplementation, or during concomitant use with other glucose-lowering agents (such as sulfonylureas and insulin) or ethanol. Elderly, debilitated, or malnourished patients, and those with adrenal or pituitary insufficiency or alcohol intoxication are particularly susceptible to hypoglycemic effects. Hypoglycemia may be difficult to recognize in the elderly, and in people who are taking β-adrenergic blocking drugs. Sitagliptin Add-on Therapy in Patients with Type 2 Diabetes Inadequately Controlled on Metformin AloneIn a 24-week placebo-controlled trial of sitagliptin 100 mg administered once daily added to a twice daily metformin regimen, there were no adverse reactions reported regardless of investigator assessment of causality in ≥5% of patients and more commonly than in patients given placebo. Discontinuation of therapy due to clinical adverse reactions was similar to the placebo treatment group (sitagliptin and metformin, 1.9%; placebo and metformin, 2.5%). Sitagliptin in Combination with Metformin and GlimepirideIn a 24-week placebo-controlled study of sitagliptin 100 mg as add-on therapy in patients with type 2 diabetes inadequately controlled on metformin and glimepiride (sitagliptin, N=116; placebo, N=113), the adverse reactions reported regardless of investigator assessment of causality in ≥5% of patients treated with sitagliptin and more commonly than in patients treated with placebo were: hypoglycemia (Table 3) and headache (6.9%, 2.7%). Sitagliptin in Combination with Metformin and Rosiglitazone In a placebo-controlled study of sitagliptin 100 mg as add-on therapy in patients with type 2 diabetes inadequately controlled on metformin and rosiglitazone (sitagliptin, N=181; placebo, N=97), the adverse reactions reported regardless of investigator assessment of causality through Week 18 in ≥5% of patients treated with sitagliptin and more commonly than in patients treated with placebo were: upper respiratory tract infection (sitagliptin, 5.5%; placebo, 5.2%) and nasopharyngitis (6.1%, 4.1%). Through Week 54, the adverse reactions reported regardless of investigator assessment of causality in ≥5% of patients treated with sitagliptin and more commonly than in patients treated with placebo were: upper respiratory tract infection (sitagliptin, 15.5%; placebo, 6.2%), nasopharyngitis (11.0%, 9.3%), peripheral edema (8.3%, 5.2%), and headache (5.5%, 4.1%). 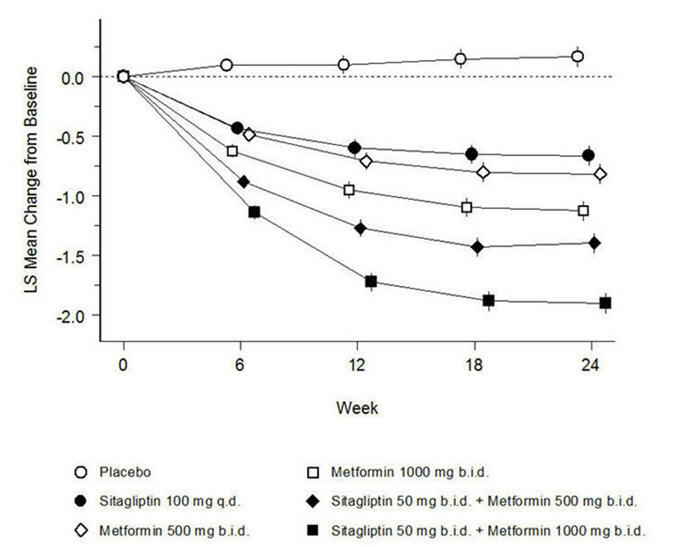 Sitagliptin in Combination with Metformin and Insulin In a 24-week placebo-controlled study of sitagliptin 100 mg as add-on therapy in patients with type 2 diabetes inadequately controlled on metformin and insulin (sitagliptin, N=229; placebo, N=233), the only adverse reaction reported regardless of investigator assessment of causality in ≥5% of patients treated with sitagliptin and more commonly than in patients treated with placebo was hypoglycemia (Table 3). Hypoglycemia In all (N=5) studies, adverse reactions of hypoglycemia were based on all reports of symptomatic hypoglycemia; a concurrent glucose measurement was not required although most (77%) reports of hypoglycemia were accompanied by a blood glucose measurement ≤70 mg/dL. When the combination of sitagliptin and metformin was coadministered with a sulfonylurea or with insulin, the percentage of patients reporting at least one adverse reaction of hypoglycemia was higher than that observed with placebo and metformin coadministered with a sulfonylurea or with insulin (Table 3).Table 3: Incidence and Rate of HypoglycemiaAdverse reactions of hypoglycemia were based on all reports of symptomatic hypoglycemia; a concurrent glucose measurement was not required: Intent-to-treat population. (Regardless of Investigator Assessment of Causality) in Placebo-Controlled Clinical Studies of Sitagliptin in Combination with Metformin Coadministered with Glimepiride or InsulinAdd-On to Glimepiride + Metformin (24 weeks)Sitagliptin 100 mg + Metformin + GlimepiridePlacebo + Metformin + GlimepirideN = 116 N = 113 Overall (%)19 (16.4)1 (0.9) Rate (episodes/patient-year)Based on total number of events (i.e., a single patient may have had multiple events).0.820.02 Severe (%)Severe events of hypoglycemia were defined as those events requiring medical assistance or exhibiting depressed level/loss of consciousness or seizure.0 (0.0)0 (0.0)Add-On to Insulin + Metformin (24 weeks)Sitagliptin 100 mg + Metformin + InsulinPlacebo + Metformin + InsulinN = 229N = 233 Overall (%)35 (15.3)19 (8.2) Rate (episodes/patient-year)0.980.61 Severe (%)1 (0.4)1 (0.4)The overall incidence of reported adverse reactions of hypoglycemia in patients with type 2 diabetes inadequately controlled on diet and exercise was 0.6% in patients given placebo, 0.6% in patients given sitagliptin alone, 0.8% in patients given metformin alone, and 1.6% in patients given sitagliptin in combination with metformin. In patients with type 2 diabetes inadequately controlled on metformin alone, the overall incidence of adverse reactions of hypoglycemia was 1.3% in patients given add-on sitagliptin and 2.1% in patients given add-on placebo.In the study of sitagliptin and add-on combination therapy with metformin and rosiglitazone, the overall incidence of hypoglycemia was 2.2% in patients given add-on sitagliptin and 0.0% in patients given add-on placebo through Week 18. Through Week 54, the overall incidence of hypoglycemia was 3.9% in patients given add-on sitagliptin and 1.0% in patients given add-on placebo. Vital Signs and ElectrocardiogramsWith the combination of sitagliptin and metformin, no clinically meaningful changes in vital signs or in ECG (including in QTc interval) were observed. SitagliptinThe most common adverse experience in sitagliptin monotherapy reported regardless of investigator assessment of causality in ≥5% of patients and more commonly than in patients given placebo was nasopharyngitis. Metformin hydrochlorideThe most common (>5%) established adverse reactions due to initiation of metformin therapy are diarrhea, nausea/vomiting, flatulence, abdominal discomfort, indigestion, asthenia, and headache. SitagliptinThe incidence of laboratory adverse reactions was similar in patients treated with sitagliptin and metformin (7.6%) compared to patients treated with placebo and metformin (8.7%). In most but not all studies, a small increase in white blood cell count (approximately 200 cells/microL difference in WBC vs placebo; mean baseline WBC approximately 6600 cells/microL) was observed due to a small increase in neutrophils. This change in laboratory parameters is not considered to be clinically relevant. Pregnancy Exposure RegistryThere is a pregnancy exposure registry that monitors pregnancy outcomes in women exposed to JANUMET during pregnancy. Health care providers are encouraged to report any prenatal exposure to JANUMET by calling the Pregnancy Registry at 1-800-986-8999. Risk SummaryThe limited available data with JANUMET in pregnant women are not sufficient to inform a drug-associated risk for major birth defects and miscarriage. Published studies with metformin use during pregnancy have not reported a clear association with metformin and major birth defect or miscarriage risk [see Data]. There are risks to the mother and fetus associated with poorly controlled diabetes in pregnancy [see Clinical Considerations]. No adverse developmental effects were observed when sitagliptin was administered to pregnant rats and rabbits during organogenesis at oral doses up to 30-times and 20-times, respectively, the 100 mg clinical dose, based on AUC. No adverse developmental effects were observed when metformin was administered to pregnant Sprague Dawley rats and rabbits during organogenesis at doses up to 2- and 6-times, respectively, a 2000 mg clinical dose, based on body surface area [see Data].The estimated background risk of major birth defects is 6-10% in women with pre-gestational diabetes with a Hemoglobin A1c >7% and has been reported to be as high as 20-25% in women with a Hemoglobin A1c >10%. In the U.S. general population, the estimated background risk of major birth defects and miscarriage in clinically recognized pregnancies is 2-4% and 15-20% respectively. Disease-Associated Maternal and/or Embryo/Fetal RiskPoorly controlled diabetes in pregnancy increases the maternal risk for diabetic ketoacidosis, pre-eclampsia, spontaneous abortions, preterm delivery, still birth, and delivery complications. Poorly controlled diabetes increases the fetal risk for major birth defects, still birth, and macrosomia related morbidity. Human DataPublished data from post-marketing studies do not report a clear association with metformin and major birth defects, miscarriage, or adverse maternal or fetal outcomes when metformin is used during pregnancy. However, these studies cannot definitely establish the absence of any risk because of methodological limitations, including small sample size and inconsistent comparator groups. Sitagliptin and MetforminNo animal reproduction studies were conducted with the coadministration of sitagliptin and metformin. SitagliptinIn embryo-fetal development studies, sitagliptin administered to pregnant rats and rabbits during organogenesis (gestation day 6 to 20) did not adversely affect developmental outcomes at oral doses up to 250 mg/kg (30-times the 100 mg clinical dose) and 125 mg/kg (20-times the 100 mg clinical dose), respectively, based on AUC. Higher doses in rats associated with maternal toxicity increased the incidence of rib malformations in offspring at 1000 mg/kg, or approximately 100-times the clinical dose, based on AUC. Placental transfer of sitagliptin was observed in pregnant rats and rabbits.Sitagliptin administered to female rats from gestation day 6 to lactation day 21 caused no functional or behavioral toxicity in offspring of rats at doses up to 1000 mg/kg. Metformin hydrochlorideMetformin hydrochloride did not cause adverse developmental effects when administered to pregnant Sprague Dawley rats and rabbits up to 600 mg/kg/day during the period of organogenesis. This represents an exposure of about 2- and 6-times a 2000 mg clinical dose based on body surface area (mg/m2) for rats and rabbits, respectively. JANUMETThere is no information regarding the presence of JANUMET in human milk, the effects on the breastfed infant, or the effects on milk production. Limited published studies report that metformin is present in human milk [see Data]. There are no reports of adverse effects on breastfed infants exposed to metformin. There is no information on the effects of metformin on milk production. Sitagliptin is present in rat milk and therefore possibly present in human milk [see Data]. The developmental and health benefits of breastfeeding should be considered along with the mother's clinical need for JANUMET and any potential adverse effects on the breastfed infant from JANUMET or from the underlying maternal condition. SitagliptinSitagliptin is secreted in the milk of lactating rats at a milk to plasma ratio of 4:1. SitagliptinOf the total number of subjects (N=3884) in Phase II and III clinical studies of sitagliptin, 725 patients were 65 years and over, while 61 patients were 75 years and over. No overall differences in safety or effectiveness were observed between subjects 65 years and over and younger subjects. While this and other reported clinical experience have not identified differences in responses between the elderly and younger patients, greater sensitivity of some older individuals cannot be ruled out. SitagliptinSitagliptin is excreted by the kidney, and sitagliptin exposure is increased in patients with renal impairment. Lower dosages are recommended in patients with eGFR less than 45 mL/min/1.73 m2 (moderate and severe renal impairment, as well as in ESRD patients requiring dialysis). Metformin hydrochlorideMetformin is substantially excreted by the kidney, and the risk of metformin accumulation and lactic acidosis increases with the degree of renal impairment. SitagliptinDuring controlled clinical trials in healthy subjects, single doses of up to 800 mg sitagliptin were administered. Maximal mean increases in QTc of 8.0 msec were observed in one study at a dose of 800 mg sitagliptin, a mean effect that is not considered clinically important [see Clinical Pharmacology (12.2)]. There is no experience with doses above 800 mg in clinical studies. In Phase I multiple-dose studies, there were no dose-related clinical adverse reactions observed with sitagliptin with doses of up to 400 mg per day for periods of up to 28 days.In the event of an overdose, it is reasonable to employ the usual supportive measures, e.g., remove unabsorbed material from the gastrointestinal tract, employ clinical monitoring (including obtaining an electrocardiogram), and institute supportive therapy as indicated by the patient's clinical status.Sitagliptin is modestly dialyzable. In clinical studies, approximately 13.5% of the dose was removed over a 3- to 4-hour hemodialysis session. Prolonged hemodialysis may be considered if clinically appropriate. It is not known if sitagliptin is dialyzable by peritoneal dialysis. Metformin hydrochlorideOverdose of metformin hydrochloride has occurred, including ingestion of amounts greater than 50 grams. Hypoglycemia was reported in approximately 10% of cases, but no causal association with metformin hydrochloride has been established. Lactic acidosis has been reported in approximately 32% of metformin overdose cases [see Warnings and Precautions (5.1)]. Metformin is dialyzable with a clearance of up to 170 mL/min under good hemodynamic conditions. Therefore, hemodialysis may be useful for removal of accumulated drug from patients in whom metformin overdosage is suspected. SitagliptinSitagliptin is an orally-active inhibitor of the dipeptidyl peptidase-4 (DPP-4) enzyme. Sitagliptin is present in JANUMET tablets in the form of sitagliptin phosphate monohydrate. Sitagliptin phosphate monohydrate is described chemically as 7-[(3R)-3-amino-1-oxo-4-(2,4,5-trifluorophenyl)butyl]-5,6,7,8-tetrahydro-3-(trifluoromethyl)-1,2,4-triazolo[4,3-a]pyrazine phosphate (1:1) monohydrate with an empirical formula of C16H15F6N5O∙H3PO4∙H2O and a molecular weight of 523.32. The structural formula is:Sitagliptin phosphate monohydrate is a white to off-white, crystalline, non-hygroscopic powder. It is soluble in water and N,N-dimethyl formamide; slightly soluble in methanol; very slightly soluble in ethanol, acetone, and acetonitrile; and insoluble in isopropanol and isopropyl acetate. JANUMETJANUMET is available for oral administration as tablets containing 64.25 mg sitagliptin phosphate monohydrate and metformin hydrochloride equivalent to: 50 mg sitagliptin as free base and 500 mg metformin hydrochloride (JANUMET 50 mg/500 mg) or 1000 mg metformin hydrochloride (JANUMET 50 mg/1000 mg). Each film-coated tablet of JANUMET contains the following inactive ingredients: microcrystalline cellulose, polyvinylpyrrolidone, sodium lauryl sulfate, and sodium stearyl fumarate. In addition, the film coating contains the following inactive ingredients: polyvinyl alcohol, polyethylene glycol, talc, titanium dioxide, red iron oxide, and black iron oxide. JANUMETJANUMET combines two antihyperglycemic agents with complementary mechanisms of action to improve glycemic control in patients with type 2 diabetes mellitus: sitagliptin, a dipeptidyl peptidase-4 (DPP-4) inhibitor, and metformin hydrochloride, a member of the biguanide class. SitagliptinSitagliptin is a DPP-4 inhibitor, which is believed to exert its actions in patients with type 2 diabetes by slowing the inactivation of incretin hormones. Concentrations of the active intact hormones are increased by sitagliptin, thereby increasing and prolonging the action of these hormones. Incretin hormones, including glucagon-like peptide-1 (GLP-1) and glucose-dependent insulinotropic polypeptide (GIP), are released by the intestine throughout the day, and levels are increased in response to a meal. These hormones are rapidly inactivated by the enzyme DPP-4. The incretins are part of an endogenous system involved in the physiologic regulation of glucose homeostasis. When blood glucose concentrations are normal or elevated, GLP-1 and GIP increase insulin synthesis and release from pancreatic beta cells by intracellular signaling pathways involving cyclic AMP. GLP-1 also lowers glucagon secretion from pancreatic alpha cells, leading to reduced hepatic glucose production. By increasing and prolonging active incretin levels, sitagliptin increases insulin release and decreases glucagon levels in the circulation in a glucose-dependent manner. Sitagliptin demonstrates selectivity for DPP-4 and does not inhibit DPP-8 or DPP-9 activity in vitro at concentrations approximating those from therapeutic doses. Metformin hydrochlorideMetformin is an antihyperglycemic agent which improves glucose tolerance in patients with type 2 diabetes mellitus, lowering both basal and postprandial plasma glucose. Its pharmacologic mechanisms of action are different from other classes of oral antihyperglycemic agents. Metformin decreases hepatic glucose production, decreases intestinal absorption of glucose, and improves insulin sensitivity by increasing peripheral glucose uptake and utilization. Metformin does not produce hypoglycemia in either patients with type 2 diabetes mellitus or normal subjects (except in special circumstances [see Warnings and Precautions (5.7)]) and does not cause hyperinsulinemia. With metformin therapy, insulin secretion remains unchanged while fasting insulin levels and day-long plasma insulin response may actually decrease. SitagliptinIn patients with type 2 diabetes mellitus, administration of sitagliptin led to inhibition of DPP-4 enzyme activity for a 24-hour period. After an oral glucose load or a meal, this DPP-4 inhibition resulted in a 2- to 3-fold increase in circulating levels of active GLP-1 and GIP, decreased glucagon concentrations, and increased responsiveness of insulin release to glucose, resulting in higher C-peptide and insulin concentrations. The rise in insulin with the decrease in glucagon was associated with lower fasting glucose concentrations and reduced glucose excursion following an oral glucose load or a meal.In studies with healthy subjects, sitagliptin did not lower blood glucose or cause hypoglycemia. Sitagliptin and Metformin hydrochloride CoadministrationIn a two-day study in healthy subjects, sitagliptin alone increased active GLP-1 concentrations, whereas metformin alone increased active and total GLP-1 concentrations to similar extents. Coadministration of sitagliptin and metformin had an additive effect on active GLP-1 concentrations. Sitagliptin, but not metformin, increased active GIP concentrations. It is unclear what these findings mean for changes in glycemic control in patients with type 2 diabetes mellitus. Cardiac ElectrophysiologyIn a randomized, placebo-controlled crossover study, 79 healthy subjects were administered a single oral dose of sitagliptin 100 mg, sitagliptin 800 mg (8 times the recommended dose), and placebo. At the recommended dose of 100 mg, there was no effect on the QTc interval obtained at the peak plasma concentration, or at any other time during the study. Following the 800-mg dose, the maximum increase in the placebo-corrected mean change in QTc from baseline at 3 hours postdose was 8.0 msec. This increase is not considered to be clinically significant. At the 800-mg dose, peak sitagliptin plasma concentrations were approximately 11 times higher than the peak concentrations following a 100-mg dose.In patients with type 2 diabetes mellitus administered sitagliptin 100 mg (N=81) or sitagliptin 200 mg (N=63) daily, there were no meaningful changes in QTc interval based on ECG data obtained at the time of expected peak plasma concentration. SitagliptinThe pharmacokinetics of sitagliptin have been extensively characterized in healthy subjects and patients with type 2 diabetes mellitus. Following a single oral 100-mg dose to healthy volunteers, mean plasma AUC of sitagliptin was 8.52 µM∙hr, Cmax was 950 nM, and apparent terminal half-life (t1/2) was 12.4 hours. Plasma AUC of sitagliptin increased in a dose-proportional manner and increased approximately 14% following 100 mg doses at steady-state compared to the first dose. The intra-subject and inter-subject coefficients of variation for sitagliptin AUC were small (5.8% and 15.1%). The pharmacokinetics of sitagliptin was generally similar in healthy subjects and in patients with type 2 diabetes mellitus. SitagliptinAfter oral administration of a 100 mg dose to healthy subjects, sitagliptin was rapidly absorbed with peak plasma concentrations (median Tmax) occurring 1 to 4 hours postdose. The absolute bioavailability of sitagliptin is approximately 87%. Effect of FoodCoadministration of a high-fat meal with sitagliptin had no effect on the pharmacokinetics of sitagliptin. Metformin hydrochlorideThe absolute bioavailability of a metformin hydrochloride 500-mg tablet given under fasting conditions is approximately 50-60%. Studies using single oral doses of metformin hydrochloride tablets 500 mg to 1,500 mg, and 850 mg to 2,550 mg (approximately 1.3 times the maximum recommended daily dosage), indicate that there is a lack of dose proportionality with increasing doses, which is due to decreased absorption rather than an alteration in elimination. Effect of FoodFood decreases the extent of and slightly delays the absorption of metformin, as shown by approximately a 40% lower mean peak plasma concentration (Cmax), a 25% lower area under the plasma concentration versus time curve (AUC), and a 35-minute prolongation of time to peak plasma concentration (Tmax) following administration of a single 850-mg tablet of metformin with food, compared to the same tablet strength administered fasting. The clinical relevance of these decreases is unknown. SitagliptinThe mean volume of distribution at steady state following a single 100-mg intravenous dose of sitagliptin to healthy subjects is approximately 198 liters. The fraction of sitagliptin reversibly bound to plasma proteins is low (38%). Metformin hydrochlorideThe apparent volume of distribution (V/F) of metformin following single oral doses of metformin hydrochloride tablets 850 mg averaged 654 ± 358 L. Metformin is negligibly bound to plasma proteins, in contrast to sulfonylureas, which are more than 90% protein bound. Metformin partitions into erythrocytes, most likely as a function of time. At usual clinical doses and dosing schedules of metformin hydrochloride tablets, steady-state plasma concentrations of metformin are reached within 24-48 hours and are generally < 1 mcg/mL. During controlled clinical trials of metformin, maximum metformin plasma levels did not exceed 5 mcg/mL, even at maximum doses. SitagliptinApproximately 79% of sitagliptin is excreted unchanged in the urine with metabolism being a minor pathway of elimination. The apparent terminal t1/2 following a 100 mg oral dose of sitagliptin was approximately 12.4 hours and renal clearance was approximately 350 mL/min. Metformin hydrochlorideFollowing oral administration, approximately 90% of the absorbed drug is eliminated via the renal route within the first 24 hours, with a plasma elimination half-life of approximately 6.2 hours. In blood, the elimination half-life is approximately 17.6 hours, suggesting that the erythrocyte mass may be a compartment of distribution. Sitagliptin Following a [14C]sitagliptin oral dose, approximately 16% of the radioactivity was excreted as metabolites of sitagliptin. Six metabolites were detected at trace levels and are not expected to contribute to the plasma DPP-4 inhibitory activity of sitagliptin. In vitro studies indicated that the primary enzyme responsible for the limited metabolism of sitagliptin was CYP3A4, with contribution from CYP2C8. SitagliptinFollowing administration of an oral [14C]sitagliptin dose to healthy subjects, approximately 100% of the administered radioactivity was eliminated in feces (13%) or urine (87%) within one week of dosing. Elimination of sitagliptin occurs primarily via renal excretion and involves active tubular secretion. Sitagliptin is a substrate for human organic anion transporter-3 (hOAT-3), which may be involved in the renal elimination of sitagliptin. The clinical relevance of hOAT-3 in sitagliptin transport has not been established. Sitagliptin is also a substrate of p-glycoprotein (P-gp), which may also be involved in mediating the renal elimination of sitagliptin. However, cyclosporine, a P-gp inhibitor, did not reduce the renal clearance of sitagliptin. Metformin hydrochlorideElimination of metformin occurs primarily via renal excretion. Renal clearance is approximately 3.5 times greater than creatinine clearance, which indicates that tubular secretion is the major route of metformin elimination. JANUMETStudies characterizing the pharmacokinetics of sitagliptin and metformin after administration of JANUMET in renally impaired patients have not been performed [see Dosage and Administration (2.2)]. Metformin hydrochlorideIn patients with decreased renal function, the plasma and blood half-life of metformin is prolonged and the renal clearance is decreased [see Contraindications (4); Warnings and Precautions (5.1)]. JANUMETStudies characterizing the pharmacokinetics of sitagliptin and metformin after administration of JANUMET in patients with hepatic impairment have not been performed. SitagliptinIn patients with moderate hepatic impairment (Child-Pugh score 7 to 9), mean AUC and Cmax of sitagliptin increased approximately 21% and 13%, respectively, compared to healthy matched controls following administration of a single 100-mg dose of sitagliptin. These differences are not considered to be clinically meaningful. There is no clinical experience in patients with severe hepatic impairment (Child-Pugh score >9) [see Use in Specific Populations (8.7)]. Metformin hydrochlorideNo pharmacokinetic studies of metformin have been conducted in patients with hepatic impairment. Sitagliptin Based on a population pharmacokinetic analysis or a composite analysis of available pharmacokinetic data, BMI, gender, and race do not have a clinically meaningful effect on the pharmacokinetics of sitagliptin. When the effects of age on renal function are taken into account, age alone did not have a clinically meaningful impact on the pharmacokinetics of sitagliptin based on a population pharmacokinetic analysis. Elderly subjects (65 to 80 years) had approximately 19% higher plasma concentrations of sitagliptin compared to younger subjects. SitagliptinStudies characterizing the pharmacokinetics of sitagliptin in pediatric patients have not been performed. JANUMETCoadministration of multiple doses of sitagliptin (50 mg) and metformin (1000 mg) given twice daily did not meaningfully alter the pharmacokinetics of either sitagliptin or metformin in patients with type 2 diabetes.Pharmacokinetic drug interaction studies with JANUMET have not been performed; however, such studies have been conducted with the individual components of JANUMET (sitagliptin and metformin hydrochloride). In Vitro Assessment of Drug Interactions Sitagliptin is not an inhibitor of CYP isozymes CYP3A4, 2C8, 2C9, 2D6, 1A2, 2C19 or 2B6, and is not an inducer of CYP3A4. Sitagliptin is a P-gp substrate but does not inhibit P-gp mediated transport of digoxin. Based on these results, sitagliptin is considered unlikely to cause interactions with other drugs that utilize these pathways.Sitagliptin is not extensively bound to plasma proteins. Therefore, the propensity of sitagliptin to be involved in clinically meaningful drug-drug interactions mediated by plasma protein binding displacement is very low. JANUMETNo animal studies have been conducted with the combined products in JANUMET to evaluate carcinogenesis, mutagenesis or impairment of fertility. The following data are based on the findings in studies with sitagliptin and metformin individually. SitagliptinA two-year carcinogenicity study was conducted in male and female rats given oral doses of sitagliptin of 50, 150, and 500 mg/kg/day. There was an increased incidence of combined liver adenoma/carcinoma in males and females and of liver carcinoma in females at 500 mg/kg. This dose results in exposures approximately 60 times the human exposure at the maximum recommended daily adult human dose (MRHD) of 100 mg/day based on AUC comparisons. Liver tumors were not observed at 150 mg/kg, approximately 20 times the human exposure at the MRHD. A two-year carcinogenicity study was conducted in male and female mice given oral doses of sitagliptin of 50, 125, 250, and 500 mg/kg/day. There was no increase in the incidence of tumors in any organ up to 500 mg/kg, approximately 70 times human exposure at the MRHD. Sitagliptin was not mutagenic or clastogenic with or without metabolic activation in the Ames bacterial mutagenicity assay, a Chinese hamster ovary (CHO) chromosome aberration assay, an in vitro cytogenetics assay in CHO, an in vitro rat hepatocyte DNA alkaline elution assay, and an in vivo micronucleus assay.In rat fertility studies with oral gavage doses of 125, 250, and 1000 mg/kg, males were treated for 4 weeks prior to mating, during mating, up to scheduled termination (approximately 8 weeks total), and females were treated 2 weeks prior to mating through gestation day 7. No adverse effect on fertility was observed at 125 mg/kg (approximately 12 times human exposure at the MRHD of 100 mg/day based on AUC comparisons). At higher doses, nondose-related increased resorptions in females were observed (approximately 25 and 100 times human exposure at the MRHD based on AUC comparison). Metformin hydrochlorideLong-term carcinogenicity studies have been performed in rats (dosing duration of 104 weeks) and mice (dosing duration of 91 weeks) at doses up to and including 900 mg/kg/day and 1500 mg/kg/day, respectively. These doses are both approximately four times the maximum recommended human daily dose of 2000 mg based on body surface area comparisons. No evidence of carcinogenicity with metformin was found in either male or female mice. Similarly, there was no tumorigenic potential observed with metformin in male rats. There was, however, an increased incidence of benign stromal uterine polyps in female rats treated with 900 mg/kg/day.There was no evidence of a mutagenic potential of metformin in the following in vitro tests: Ames test (S. typhimurium), gene mutation test (mouse lymphoma cells), or chromosomal aberrations test (human lymphocytes). Results in the in vivo mouse micronucleus test were also negative. Fertility of male or female rats was unaffected by metformin when administered at doses as high as 600 mg/kg/day, which is approximately three times the maximum recommended human daily dose based on body surface area comparisons. Sitagliptin and Metformin Coadministration in Patients with Type 2 Diabetes Inadequately Controlled on Diet and ExerciseA total of 1091 patients with type 2 diabetes and inadequate glycemic control on diet and exercise participated in a 24-week, randomized, double-blind, placebo-controlled factorial study designed to assess the efficacy of sitagliptin and metformin coadministration. Patients on an antihyperglycemic agent (N=541) underwent a diet, exercise, and drug washout period of up to 12 weeks duration. After the washout period, patients with inadequate glycemic control (A1C 7.5% to 11%) were randomized after completing a 2-week single-blind placebo run-in period. Patients not on antihyperglycemic agents at study entry (N=550) with inadequate glycemic control (A1C 7.5% to 11%) immediately entered the 2-week single-blind placebo run-in period and then were randomized. Approximately equal numbers of patients were randomized to receive placebo, 100 mg of sitagliptin once daily, 500 mg or 1000 mg of metformin twice daily, or 50 mg of sitagliptin twice daily in combination with 500 mg or 1000 mg of metformin twice daily. Patients who failed to meet specific glycemic goals during the study were treated with glyburide (glibenclamide) rescue.Sitagliptin and metformin coadministration provided significant improvements in A1C, FPG, and 2-hour PPG compared to placebo, to metformin alone, and to sitagliptin alone (Table 8, Figure 1). Mean reductions from baseline in A1C were generally greater for patients with higher baseline A1C values. For patients not on an antihyperglycemic agent at study entry, mean reductions from baseline in A1C were: sitagliptin 100 mg once daily, -1.1%; metformin 500 mg bid, -1.1%; metformin 1000 mg bid, -1.2%; sitagliptin 50 mg bid with metformin 500 mg bid, -1.6%; sitagliptin 50 mg bid with metformin 1000 mg bid, -1.9%; and for patients receiving placebo, -0.2%. Lipid effects were generally neutral. The decrease in body weight in the groups given sitagliptin in combination with metformin was similar to that in the groups given metformin alone or placebo.Table 8: Glycemic Parameters at Final Visit (24-Week Study) for Sitagliptin and Metformin, Alone and in Combination in Patients with Type 2 Diabetes Inadequately Controlled on Diet and ExerciseIntent-to-treat population using last observation on study prior to glyburide (glibenclamide) rescue therapy. Placebo Sitagliptin 100 mg once daily Metformin500 mg twice daily Metformin1000 mg twice dailySitagliptin50 mg twice daily +Metformin500 mg twice dailySitagliptin50 mg twice daily +Metformin1000 mg twice dailyA1C (%)N = 165N = 175N = 178N = 177N = 183N = 178 Baseline (mean)8.78.98.98.78.88.8 Change from baseline (adjusted meanLeast squares means adjusted for prior antihyperglycemic therapy status and baseline value. )0.2-0.7-0.8-1.1-1.4-1.9 Difference from placebo (adjusted mean) (95% CI)-0.8p<0.001 compared to placebo. (-1.1, -0.6)-1.0(-1.2, -0.8)-1.3(-1.5, -1.1)-1.6(-1.8, -1.3)-2.1(-2.3, -1.8) Patients (%) achieving A1C <7%15 (9%)35 (20%)41 (23%)68 (38%)79 (43%)118 (66%) % Patients receiving rescue medication3221171282FPG (mg/dL) N = 169N = 178N = 179N = 179N = 183N = 180 Baseline (mean)196201205197204197 Change from baseline (adjusted mean)6-17-27-29-47-64 Difference from placebo (adjusted mean) (95% CI)-23(-33, -14)-33(-43, -24)-35(-45, -26)-53(-62, -43)-70(-79, -60)2-hour PPG (mg/dL) N = 129N = 136N = 141N = 138N = 147N = 152 Baseline (mean)277285293283292287 Change from baseline (adjusted mean)0-52-53-78-93-117 Difference from placebo (adjusted mean) (95% CI)-52(-67, -37)-54(-69, -39)-78(-93, -63)-93(-107, -78)-117(-131, -102)Figure 1: Mean Change from Baseline for A1C (%) over 24 Weeks with Sitagliptin and Metformin, Alone and in Combination in Patients with Type 2 Diabetes Inadequately Controlled with Diet and ExerciseAll Patients Treated Population: least squares means adjusted for prior antihyperglycemic therapy and baseline value.Initial combination therapy or maintenance of combination therapy should be individualized and are left to the discretion of the health care provider. Sitagliptin Add-on Therapy vs. Glipizide Add-on Therapy in Patients with Type 2 Diabetes Inadequately Controlled on MetforminThe efficacy of sitagliptin was evaluated in a 52-week, double-blind, glipizide-controlled noninferiority trial in patients with type 2 diabetes. Patients not on treatment or on other antihyperglycemic agents entered a run-in treatment period of up to 12 weeks duration with metformin monotherapy (dose of ≥1500 mg per day) which included washout of medications other than metformin, if applicable. After the run-in period, those with inadequate glycemic control (A1C 6.5% to 10%) were randomized 1:1 to the addition of sitagliptin 100 mg once daily or glipizide for 52 weeks. Patients receiving glipizide were given an initial dosage of 5 mg/day and then electively titrated over the next 18 weeks to a maximum dosage of 20 mg/day as needed to optimize glycemic control. Thereafter, the glipizide dose was to be kept constant, except for down-titration to prevent hypoglycemia. 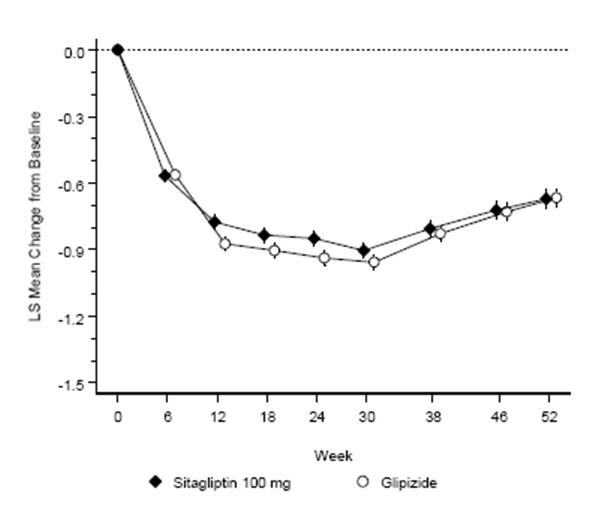 The mean dose of glipizide after the titration period was 10 mg.After 52 weeks, sitagliptin and glipizide had similar mean reductions from baseline in A1C in the intent-to-treat analysis (Table 13). These results were consistent with the per protocol analysis (Figure 2). A conclusion in favor of the non-inferiority of sitagliptin to glipizide may be limited to patients with baseline A1C comparable to those included in the study (over 70% of patients had baseline A1C less than 8% and over 90% had A1C less than 9%).Table 13: Glycemic Parameters in a 52-Week Study Comparing Sitagliptin to Glipizide as Add-On Therapy in Patients Inadequately Controlled on Metformin (Intent-to-Treat Population)The intent-to-treat analysis used the patients' last observation in the study prior to discontinuation.Sitagliptin 100 mg + MetforminGlipizide + MetforminA1C (%)N = 576N = 559 Baseline (mean)7.77.6 Change from baseline (adjusted meanLeast squares means adjusted for prior antihyperglycemic therapy status and baseline A1C value. )-0.5-0.6FPG (mg/dL) N = 583N = 568 Baseline (mean) 166164 Change from baseline (adjusted mean)-8-8Figure 2: Mean Change from Baseline for A1C (%) Over 52 Weeks in a Study Comparing Sitagliptin to Glipizide as Add-On Therapy in Patients Inadequately Controlled on Metformin (Per Protocol Population) The per protocol population (mean baseline A1C of 7.5%) included patients without major protocol violations who had observations at baseline and at Week 52.The incidence of hypoglycemia in the sitagliptin group (4.9%) was significantly (p<0.001) lower than that in the glipizide group (32.0%). Patients treated with sitagliptin exhibited a significant mean decrease from baseline in body weight compared to a significant weight gain in patients administered glipizide (-1.5 kg vs. +1.1 kg). There have been postmarketing reports of acute pancreatitis, including fatal and non-fatal hemorrhagic or necrotizing pancreatitis, in patients taking JANUMET. After initiation of JANUMET, patients should be observed carefully for signs and symptoms of pancreatitis. If pancreatitis is suspected, JANUMET should promptly be discontinued and appropriate management should be initiated. It is unknown whether patients with a history of pancreatitis are at increased risk for the development of pancreatitis while using JANUMET. An association between dipeptidyl peptidase-4 (DPP-4) inhibitor treatment and heart failure has been observed in cardiovascular outcomes trials for two other members of the DPP-4 inhibitor class. These trials evaluated patients with type 2 diabetes mellitus and atherosclerotic cardiovascular disease.Consider the risks and benefits of JANUMET prior to initiating treatment in patients at risk for heart failure, such as those with a prior history of heart failure and a history of renal impairment, and observe these patients for signs and symptoms of heart failure during therapy. Advise patients of the characteristic symptoms of heart failure and to immediately report such symptoms. If heart failure develops, evaluate and manage according to current standards of care and consider discontinuation of JANUMET. Metformin and sitagliptin are known to be substantially excreted by the kidney. In controlled clinical trials of metformin of 29 weeks duration, a decrease to subnormal levels of previously normal serum Vitamin B12 levels, without clinical manifestations, was observed in approximately 7% of patients. Such decrease, possibly due to interference with B12 absorption from the B12-intrinsic factor complex, is, however, very rarely associated with anemia and appears to be rapidly reversible with discontinuation of metformin or Vitamin B12 supplementation. Measurement of hematologic parameters on an annual basis is advised in patients on JANUMET and any apparent abnormalities should be appropriately investigated and managed. [See Adverse Reactions (6.1). ]Certain individuals (those with inadequate Vitamin B12 or calcium intake or absorption) appear to be predisposed to developing subnormal Vitamin B12 levels. In these patients, routine serum Vitamin B12 measurements at two- to three-year intervals may be useful. A patient with type 2 diabetes previously well controlled on JANUMET who develops laboratory abnormalities or clinical illness (especially vague and poorly defined illness) should be evaluated promptly for evidence of ketoacidosis or lactic acidosis. Evaluation should include serum electrolytes and ketones, blood glucose and, if indicated, blood pH, lactate, pyruvate, and metformin levels. If acidosis of either form occurs, JANUMET must be stopped immediately and other appropriate corrective measures initiated. When a patient stabilized on any diabetic regimen is exposed to stress such as fever, trauma, infection, or surgery, a temporary loss of glycemic control may occur. At such times, it may be necessary to withhold JANUMET and temporarily administer insulin. JANUMET may be reinstituted after the acute episode is resolved. There have been postmarketing reports of serious hypersensitivity reactions in patients treated with sitagliptin, one of the components of JANUMET. These reactions include anaphylaxis, angioedema, and exfoliative skin conditions including Stevens-Johnson syndrome. Onset of these reactions occurred within the first 3 months after initiation of treatment with sitagliptin, with some reports occurring after the first dose. If a hypersensitivity reaction is suspected, discontinue JANUMET, assess for other potential causes for the event, and institute alternative treatment for diabetes. [See Adverse Reactions (6.2). ]Angioedema has also been reported with other DPP-4 inhibitors. Use caution in a patient with a history of angioedema with another DPP-4 inhibitor because it is unknown whether such patients will be predisposed to angioedema with JANUMET. Postmarketing cases of bullous pemphigoid requiring hospitalization have been reported with DPP-4 inhibitor use. In reported cases, patients typically recovered with topical or systemic immunosuppressive treatment and discontinuation of the DPP-4 inhibitor. Tell patients to report development of blisters or erosions while receiving JANUMET. If bullous pemphigoid is suspected, JANUMET should be discontinued and referral to a dermatologist should be considered for diagnosis and appropriate treatment. There have been no clinical studies establishing conclusive evidence of macrovascular risk reduction with JANUMET. Additional adverse reactions have been identified during postapproval use of JANUMET, sitagliptin, or metformin. Because these reactions are reported voluntarily from a population of uncertain size, it is generally not possible to reliably estimate their frequency or establish a causal relationship to drug exposure.Hypersensitivity reactions including anaphylaxis, angioedema, rash, urticaria, cutaneous vasculitis, and exfoliative skin conditions including Stevens-Johnson syndrome [see Warnings and Precautions (5.9)]; upper respiratory tract infection; hepatic enzyme elevations; acute pancreatitis, including fatal and non-fatal hemorrhagic and necrotizing pancreatitis [see Indications and Usage (1); Warnings and Precautions (5.2)]; worsening renal function, including acute renal failure (sometimes requiring dialysis) [see Warnings and Precautions (5.4)]; severe and disabling arthralgia [see Warnings and Precautions (5.10)]; bullous pemphigoid [see Warnings and Precautions (5.11)]; constipation; vomiting; headache; myalgia; pain in extremity; back pain; pruritus; mouth ulceration; stomatitis; cholestatic, hepatocellular, and mixed hepatocellular liver injury. Topiramate or other carbonic anhydrase inhibitors (e.g., zonisamide, acetazolamide or dichlorphenamide) frequently cause a decrease in serum bicarbonate and induce non-anion gap, hyperchloremic metabolic acidosis. Concomitant use of these drugs with JANUMET may increase the risk of lactic acidosis. Consider more frequent monitoring of these patients. Concomitant use of drugs that interfere with common renal tubular transport systems involved in the renal elimination of metformin (e.g., organic cationic transporter-2 [OCT2] / multidrug and toxin extrusion [MATE] inhibitors such as ranolazine, vandetanib, dolutegravir, and cimetidine) could increase systemic exposure to metformin and may increase the risk for lactic acidosis [see Clinical Pharmacology (12.3)]. Consider the benefits and risks of concomitant use. Alcohol is known to potentiate the effect of metformin on lactate metabolism. Warn patients against excessive alcohol intake while receiving JANUMET. Certain drugs tend to produce hyperglycemia and may lead to loss of glycemic control. These drugs include the thiazides and other diuretics, corticosteroids, phenothiazines, thyroid products, estrogens, oral contraceptives, phenytoin, nicotinic acid, sympathomimetics, calcium channel blocking drugs, and isoniazid. When such drugs are administered to a patient receiving JANUMET the patient should be closely observed to maintain adequate glycemic control. There was a slight increase in the area under the curve (AUC, 11%) and mean peak drug concentration (Cmax, 18%) of digoxin with the coadministration of 100 mg sitagliptin for 10 days. Patients receiving digoxin should be monitored appropriately. No dosage adjustment of digoxin or JANUMET is recommended. Safety and effectiveness of JANUMET in pediatric patients under 18 years have not been established. 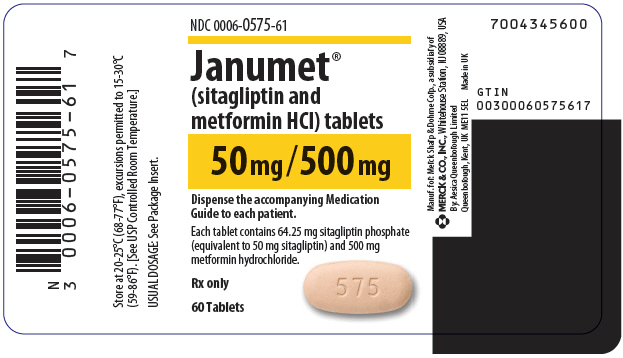 JANUMET (sitagliptin and metformin HCl) tablets contain two oral antihyperglycemic drugs used in the management of type 2 diabetes: sitagliptin and metformin hydrochloride. 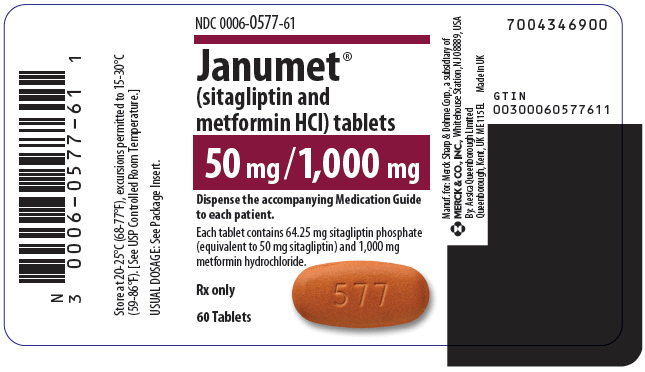 The coadministration of sitagliptin and metformin has been studied in patients with type 2 diabetes inadequately controlled on diet and exercise and in combination with other antihyperglycemic agents.None of the clinical efficacy studies described below was conducted with JANUMET; however, bioequivalence of JANUMET with coadministered sitagliptin and metformin hydrochloride tablets was demonstrated. No. 6747 — Tablets JANUMET, 50 mg/500 mg, are light pink, capsule-shaped, film-coated tablets with "575" debossed on one side. They are supplied as follows:NDC 0006-0575-61 unit-of-use bottles of 60NDC 0006-0575-62 unit-of-use bottles of 180NDC 0006-0575-82 bulk bottles of 1000.No. 6749 — Tablets JANUMET, 50 mg/1000 mg, are red, capsule-shaped, film-coated tablets with "577" debossed on one side. They are supplied as follows:NDC 0006-0577-61 unit-of-use bottles of 60NDC 0006-0577-62 unit-of-use bottles of 180NDC 0006-0577-82 bulk bottles of 1000. Patients should be informed of the potential risks and benefits of JANUMET and of alternative modes of therapy. They should also be informed about the importance of adherence to dietary instructions, regular physical activity, periodic blood glucose monitoring and A1C testing, recognition and management of hypoglycemia and hyperglycemia, and assessment for diabetes complications. During periods of stress such as fever, trauma, infection, or surgery, medication requirements may change and patients should be advised to seek medical advice promptly. The risks of lactic acidosis due to the metformin component, its symptoms, and conditions that predispose to its development, as noted in Warnings and Precautions (5.1), should be explained to patients. Patients should be advised to discontinue JANUMET immediately and to promptly notify their health practitioner if unexplained hyperventilation, myalgia, malaise, unusual somnolence, dizziness, slow or irregular heart beat, sensation of feeling cold (especially in the extremities) or other nonspecific symptoms occur. Gastrointestinal symptoms are common during initiation of metformin treatment and may occur during initiation of JANUMET therapy; however, patients should consult their physician if they develop unexplained symptoms. Although gastrointestinal symptoms that occur after stabilization are unlikely to be drug related, such an occurrence of symptoms should be evaluated to determine if it may be due to lactic acidosis or other serious disease. Instruct patients to inform their doctor that they are taking JANUMET prior to any surgical or radiological procedure, as temporary discontinuation of JANUMET may be required until renal function has been confirmed to have returned to its prior level [see Warnings and Precautions (5.1)].Patients should be counseled against excessive alcohol intake, either acute or chronic, while receiving JANUMET.Patients should be informed about the importance of regular testing of renal function and hematological parameters when receiving treatment with JANUMET.Patients should be informed that acute pancreatitis has been reported during postmarketing use of JANUMET. Patients should be informed that persistent severe abdominal pain, sometimes radiating to the back, which may or may not be accompanied by vomiting, is the hallmark symptom of acute pancreatitis. Patients should be instructed to promptly discontinue JANUMET and contact their physician if persistent severe abdominal pain occurs [see Warnings and Precautions (5.2)].Patients should be informed of the signs and symptoms of heart failure. Before initiating JANUMET, patients should be asked about a history of heart failure or other risk factors for heart failure including moderate to severe renal impairment. Patients should be instructed to contact their health care provider as soon as possible if they experience symptoms of heart failure, including increasing shortness of breath, rapid increase in weight or swelling of the feet [see Warnings and Precautions (5.3)].Patients should be informed that the incidence of hypoglycemia is increased when JANUMET is added to an insulin secretagogue (e.g., sulfonylurea) or insulin therapy and that a lower dose of the insulin secretagogue or insulin may be required to reduce the risk of hypoglycemia.Patients should be informed that allergic reactions have been reported during postmarketing use of sitagliptin, one of the components of JANUMET. If symptoms of allergic reactions (including rash, hives, and swelling of the face, lips, tongue, and throat that may cause difficulty in breathing or swallowing) occur, patients must stop taking JANUMET and seek medical advice promptly.Inform patients that severe and disabling joint pain may occur with this class of drugs. The time to onset of symptoms can range from one day to years. Instruct patients to seek medical advice if severe joint pain occurs [see Warnings and Precautions (5.10)].Inform patients that bullous pemphigoid may occur with this class of drugs. Instruct patients to seek medical advice if blisters or erosions occur [see Warnings and Precautions (5.11)].Patients should be informed that the tablets must never be split or divided before swallowing.Physicians should instruct their patients to read the Medication Guide before starting JANUMET therapy and to reread each time the prescription is renewed. Patients should be instructed to inform their doctor if they develop any bothersome or unusual symptom, or if any symptom persists or worsens. Response to all diabetic therapies should be monitored by periodic measurements of blood glucose and A1C levels, with a goal of decreasing these levels towards the normal range. A1C is especially useful for evaluating long-term glycemic control.Initial and periodic monitoring of hematologic parameters (e.g., hemoglobin/hematocrit and red blood cell indices) and renal function (serum creatinine) should be performed, at least on an annual basis. While megaloblastic anemia has rarely been seen with metformin therapy, if this is suspected, Vitamin B12 deficiency should be excluded.